Entering the Serenity Event Center through the double doors you will see two large reception areas and four French doors that lead to a banquet hall with a warming kitchen. 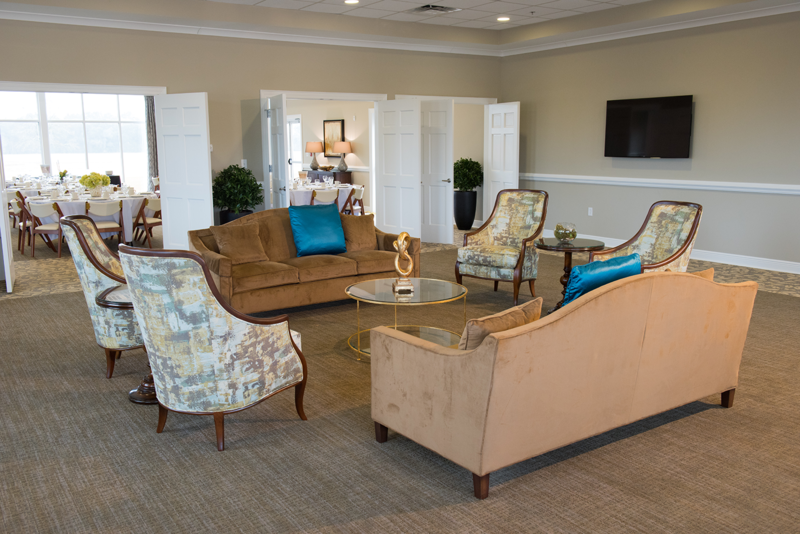 The reception areas are appointed with comfortable couches, oversized armchairs, buffet tables, coffee tables, end tables and two 50-inch flat screen high definition television. 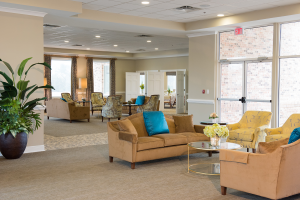 The two reception areas are approximately 2000 ft. The rooms have been configured to accommodate a band and a dance floor. Restrooms, a private room and small sitting area are located down a quiet hallway. The banquet hall can be separated from the reception area by closing the French doors that divide the banquet hall/auditorium from the reception area. The banquet hall can comfortably seat 100 people for a formal need. The rental fee includes the use of ten 72″ table rounds, table linens, and 100 white padded leather chairs. This is one of the possible configurations. Other configurations include 100 chairs set for auditorium-style seating or in a U-shape for meetings and seminars. The banquet hall has the latest in audio/visual equipment including a DLP video projector, a 120-inch screen, two wireless microphones, connectivity to DVD player, Blu-ray player, computer and tablet. A podium is also available for use. Our friendly, professional environment, variety of meeting options, and state-of-the-art technology make the Serenity Event Center the perfect place for your next business event, meeting, conference or holiday party. The Serenity Event Center provides event essentials at no extra charge, including tables, chairs, tablecloths, audio/visual equipment. You are welcome to bring snacks or a caterer of your choice and we will set up the banquet hall according to your custom request. Serenity Event Center is a classically beautiful event venue that was built with you in mind. Serenity understands that every couple has their own style, budget and vision for their wedding. We want to provide you with all of the event essentials for your special day, including tables, chairs and tablecloths. 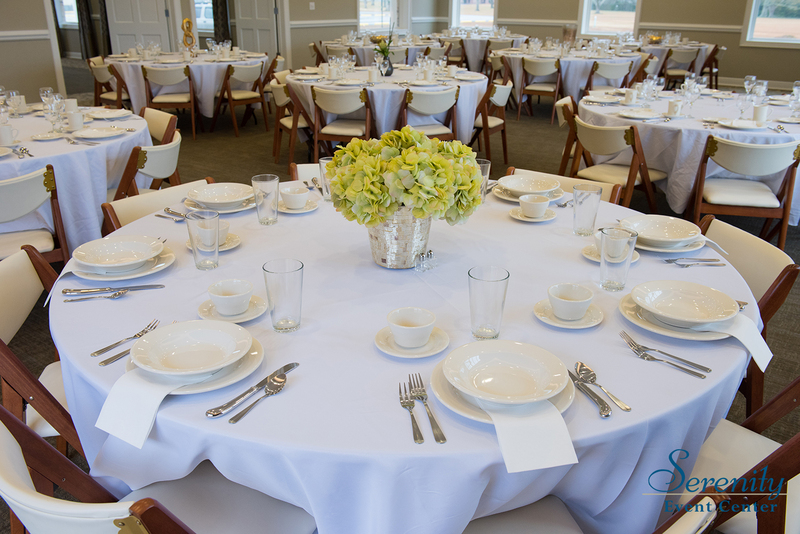 With a small extra fee we also offer formal place settings for up to 100 guests. We will work with you to make your day memorable from start to finish. Serenity Event Center’s beautiful and classic design makes for a perfect location for anniversary, graduation or retirement parties as well as family reunions and bridal or baby showers. 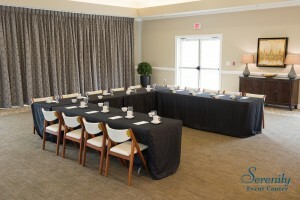 Let our event coordinator and staff help you pick the perfect room configuration for your event.